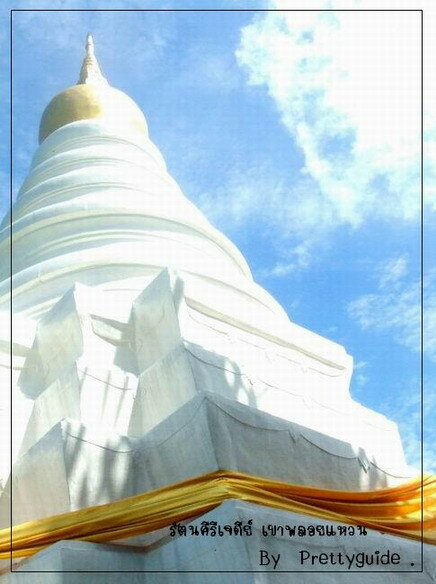 Ratana Pagoda in LangKa style, It was built since Rama the 4th,12.75 meter high by Phrayachaiyabodi_narongruechai in 1836 Having the last renovation in 1853. With in the Pagoda, there are the Buddha's Relic on the top portion of the pagoda This pagoda situated on the top of the mountain ridge in the direction of lightly east-west direction approximately 5 kilometers long This mountain ridge separated the salt water zone in the southern part from the fresh water zone in the north of the mountain The top of this mountain is about 400 meters from the base area This mountain contain some basalt rock from the volcano period, so it's been rich in many precious stones for the whole area, Down to bottom of this mountain there are so many precious stone mines, big and small using the labour to dig them out deep in to the ground about 10 to 15 meters down to the layer of precious stones. Beside the precious stones, on this mountain still rich of black onyx , some of them can be found along the trail The whole mountain is covered by the bushes of many kinds of trees. And the plots of rubber trees near the mountain base. When I am a boy, finished 6th grade, was going to leave the home town to further study in Bangkok As we walking from the home to the road close to the mountain before dawn about 5 o'clock in the morning with my daddy and ancle, before we reach the mountain about 1 kilometer left, look beyond the bamboo top we saw the big bright bulk most lightly brighten as the sun, staying on the top of the pagoda and we can see it for 10 minute may be, At that time I don't have enough knowledge about the miracle or normal nature of the Buddha's relic can create what many people to have that experience, yes the good experience, if you have your own belief on such phenomena, you can wish any good thing the Buddha's relic is ready to support your wish. Me ,daddy and ancle just know what we had seen it is a good luck for me to get the further study in the famous school, the one those my friends at the old school scare to take the exam, left me the only one to go ahead, before going to Chulalongkorn University after that.